But these retailers are chasing very tiny cost reductions in the overall retail prices of garments. The graphic above is taken from a Tumblr post by retailer Everlane (they are touting their own business model of removing wholesalers, so they do have a particular point of view in promulgating the numbers). 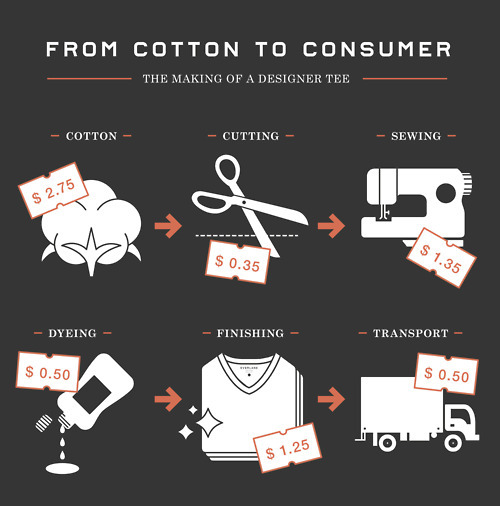 In this version of the industry, we see $1.35 going to the workers who sew a shirt and thirty five cents to the worker who cuts the fabric. The overall direct costs in this case come to $6.70. The second half of the graphic in the Tumblr post shows that the the t-shirt is then sold to a wholesaler for $15 and the retailer then sells to a consumer for $50. At least when it comes to designer t-shirts retailing for $50 (okay, that leaves out WalMart but from these stories it looks as though at least some high end retailers and the low price retailers share many of the same garment factories) the wages paid to garment workers are only a few percent of the overall retail price. And yet the companies apply huge pressure to the owners of the garment factories because John Galt tells them that the “job creators” at these name-brand labels deserve huge profits while governments must stay out of the way of the engines of wealth. Rejecting artificial demand created by a name brand label that exploits low wage garment workers would be wonderful first step toward improving the situation. However, this move needs to be followed by actively embracing the concept of living wages and safe working conditions if the evils of the current situation are to be addressed fully. I notice that graphic left out everything between the cotton boll and the cutting. That’s the spinning and and knitting, which surely adds to the cost (without them, NO shirt). @Phil Perspective: Speaking of Yggles did anyone see this? Jan Egeland, Europe Director Human Rights Watch, Former UN Under-Secretary General for Humanitarian Affairs: This is the story of a dictator who got away with it. An authoritarian regime that could repress its own citizens, steal from its own citizens, never ever go into any form of democracy, democratic way of consulting with its citizens, and getting away with it, because from Russia in the north to the Asian trading partners in the East to the West, nobody’s really criticizing this dictatorship. Scott Horton, Contributing Editor Harper’s Magazine: Uzbekistan is, even in the post-Soviet space, it is the outstanding example of a kleptocracy, that is, a government where one family runs the country and runs the country for its own benefit and its own bank account. Craig Murray, Former British Ambassador to Uzbekistan: I’d been in the country for two weeks, I think, when the Uzbek government was advertising to Western missions that they had captured an Al Qaeda cell and were having a trial. So I went to the trial to look. And as I was there, one of the witnesses, who was an old man, giving evidence said he wished to retract his evidence. He’d given evidence against two of the accused, who were his nephews, but he said the evidence had been extracted from him under torture, and in fact they tortured his children in front of him until he had signed the statement. And as he gave that evidence, by chance I was situated in the courtroom within touching distance of him, and it just struck me as truth. You know often you can tell, not much entirely in a logical way, you can just feel when somebody’s telling the truth or not, and it just came across as very truthful. And it made me start to question what was happening. Once it became known to people in Tashkent that I was questioning what was happening, people started coming to me with evidence, you know, torture victims themselves came, people with photographs showing torture injuries, letters smuggled out of jails, and we started to compile information. We then had a couple of months later Theo Van Boven’s visits from the UN, and we worked very carefully with him and helped him in fact to circumvent some of the official obstructions that were placed in the way of his visit and helped him to meet torture victims. So that was a way we went about gathering information. But you know it then became plain to me that the most severe physical torture was affecting hundreds of people a year in Uzbekistan. The scale of it was staggering. Theo van Boven, former UN Special Rapporteur on Torture: Whenever someone is accused of an offense, whether it is an economic offense, political offense, or just a common criminal offense, the regular procedure is that someone is put under heavy pressure or under torture to sign already a statement and that statement is then used as evidence. Well, this is done, as far as I could find out in listening to all these victims and witnesses, this is done as a part of the procedures, you see? Sanjar Umarov, former political prisoner, Chairman of the Sunshine Coalition of Uzbekistan: You know, this was just people I think they took from the street, the young men, and accused them and beat them, and they obliged to agree with because under torture they agree to everything just to stop the torture. I spent nearly half of my four years in isolation units and I saw all the injustice and I saw all regime suppression in that place, and this is darkest place in the society, darkest. Craig Murray: The cotton industry in Uzbekistan remains by far the largest chunk of Uzbekistan’s exports, Uzbekistan’s hard currency earnings, and its only trade is through the state trading companies. The farms get a tiny percentage of the income, either state farms or private farms, mostly state farms; the percentage of income that reaches them is tiny. The percentage that reaches the laborers who pick the cotton and toil in the fields doing back-breaking work is even smaller. The cotton makes huge profits which go to finance the regime in terms of a state apparatus, but also which go into the Karimov family, the regime families, through their positions in the state trading companies and through backhanders and corruption. The work of picking cotton is awful. A cotton pod is actually quite spiny. You have to make a quota of kilos per day, and cotton fiber, if you can imagine, for those who haven’t handled it, if you can imagine taking cotton, a ball of cotton wool, and fluffing it right out until it’s as fine as you can get, that’s what the stuff is like. And you get it in small bits […] apart, it cuts your fingers. And to picking 9 kilos a day, as some children have to, is just an extraordinary amount of physical effort, and it’s conducted in a terrible climate. Uzbekistan has an extreme continental climate. At the start of the season they can be, and I’ve seen it, you know, small children, 7, 8 years old, can be picking cotton in 40-degree centigrade, in the baking sun, with no shade and no clean water to drink. The only water they have to drink is the muddy water from the irrigation ditch. By the end of the season, a few months later, it can be winter. I have seen children pick cotton in the snow. So just how bad this is is something which people don’t really always grasp. Scott Horton: I think it’s very, very clear that Germany has invested a lot in its relationship with Uzbekistan. The investments have been focused on the security sector and they have been focused specifically on Luftwaffe Stutzpunkte, which is the special military installation near Termez which has played a huge role with NATO logistics and operations in Afghanistan. It’s also a specifically German-Uzbek relationship, not a NATO relationship, and one of the major questions is why is that so? Why is it specifically German? And the answer to that question may very well be on the Uzbek side that the Uzbeks feel that they’ve developed a good rapport with Germany, and also I think that they feel that Germany is prepared to evade sanctions when they’re imposed by the European Union and potentially even by their NATO partners, so I think there are definitely some very troubling elements in this relationship. Theo van Boven: I’m inclined to think that these steps of accommodation, appeasement if you may call it, that they are not conducive to human rights in the country, particularly, although the Uzbek authorities claim differently, but in particular, since you know from all kinds of sources that the real situation of human rights and the question of torture and so on is not under control, has not improved. So I’m rather critical of the stand of the European Union and, let us face it, that on Uzbekistan Germany played a sort of leading role to accommodate for strategic economic reasons as well. Craig Murray: If you ask me to rank genuinely what I believe the British, American and German governments’ interests are in Uzbekistan, I’d say interest number one is military support in Afghanistan, interest number two is economic interest, the potential oil and gas and trading links, and interest number three, a long way below the others, is anything to do with human rights, good governance or what happens to the ordinary Uzbek people. I think it’s extremely unfortunate that the Karimov regime views the West as weak, that the West won’t maintain positions – the West said we’re going to put on sanctions until you do certain things in response to Andijan like let in an intentional investigation – none of those things were done, and the West then lifted the sanctions. The Karimov regime, you know, is a brutal regime and a regime in which might is right and, just, am I stronger than you, and now Karimov thinks he is stronger than the West. Scott Horton: The European Union did, in the wake of the massacre that occurred in Andijan, impose restrictions on its members’ dealings with Uzbekistan, and the restrictions were focused specifically on the state security sector, that is, the very people who had been involved in the crackdown and massacre. And Germany I think clearly violated those restrictions by providing training. Not only did it provide military training, it provided them to some of the same forces that had been involved in the Andijan crackdown, so effectively Germany made a farce of the European Union sanctions regime. Jan Egeland: I think it’s curious to see that countries who are the main market for the cotton of Uzbekistan, who are actually transferring tens of millions of Euros to military bases, to access to the airports, to use the facilities of Uzbekistan, these countries who are giving all of this money and doing all of these purchases feel that they are the weak part and the dictatorship that are receiving all of this money are in the strong position. Of course they are misinterpreting their bargaining power. If they told Uzbekistan enough is enough, I think they could put pressure on this government. If there is one thing we’ve learned from the Arab Spring, it is the following: It is never, ever a good idea to go to bed with a dictatorship. It will come back to haunt you later. @P J Evans: PJ, I heard a story recently (podcast? radio?) about Afghanistan farmers who have quit growing cotton that we had encouraged them to grow, and returned to growing opium because cotton didn’t pay. I was thinking it must be hard to compete to the bottom with slave labor next door in Uzbekistan, and Murray’s post makes it clear that slave market is supported by the West and NATO, especially Germany. Also, the music is awesome, as is the phrase Bush Lie Bury! @harpie: Thanks, harpie. I hadn’t seen that one, but I am encouraged that the whole concept of how poor regulation and zoning led to the disaster is starting to see more and more attention. @thatvisionthing: I read Craig Murray’s blog most days, he often goes for a spell without posting but I check every day, and think as I read how wonderful it would be to have more like him. He has also made much of what he’s written freely available, see the side bar on his blog. Give me tariffs or give me death …………. Why are we trading with these people? Jim, I just wanted to tell you I used your “Lie Bury” phrase in a comment on a Greenwald column, here. My prayers to the victims of a T shirt factory in Bangladesh! It is also our priority to check out the condition of the workplace f our suppliers. We must not only base on cheap outsource product but also the safety of workers.